The Maryland Terrapins have already clinched a double bye in the Big Ten tournament, but Mark Turgeon does not want to play with nothing to lose against Indiana because you “set yourself up for embarrassment.” Whether the Terps were looked ahead or not we will never know, but what we do know is that they did get embarrassed on national television. After giving up a 23-6 run to end the first half, Maryland was not competitive for the rest of the bout. Their offense was mind-numbingly atrocious, while their transition defense was not much better. The Terrapins might be one of the coldest teams in the country for their talent as they drop four of their last six; this one 80-62. Basketball, especially the college variety, is extremely volatile and there can be momentum changing plays often. Maryland got off to a surprisingly fast start on the road with a 10-2 run, but Indiana responded right back with a 10-2 run of their own. The Terps got three straight buckets inside, which the Hoosiers equally countered with a couple of 3-pointers. Both teams were shooting better than 50 percent from the field but that did not last for long for one of the teams. When Melo Trimble hit a pull-up jumper in transition after picking Troy Williams’ pocked, the Terps were up 22-18 and feeling pretty good about themselves. 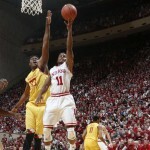 Then their offense took a horrendous turn, while the Hoosiers were no where close to slowing down. Maryland scored just six points the rest of the half as Indiana went on a 23-6 run. After a good start on the glass early, the Terps lost the battle on the boards 18-12 at halftime. Moreover their perimeter defense was again suspect, especially when playing two bigs while everyone on the Hoosiers team has the capability on making 3-pointers. While Maryland shot 3 of 15 to end the half, Indiana made six threes and were 55.6 percent from the field to hold a 41-28 advantage. Midway through the second half, Mark Turgeon finally submitted to Indiana’s small lineup by not playing Robert Carter Jr. and Diamond Stone together. 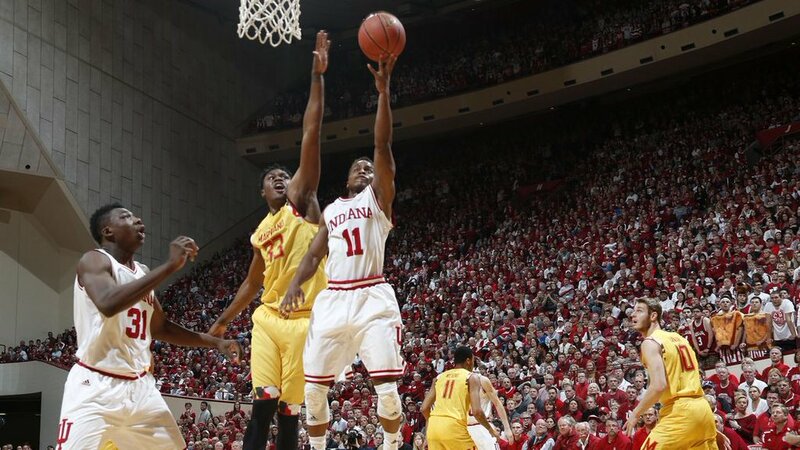 It helped the perimeter defense as Indiana only shot 2 of 9 from beyond the arc in the second half. The Terps were able to get back within single-digits with a Jaylen Brantley 3-pointer but could not get any closer as their transition defense let them down all day. While going small Turgeon also let the dogs loose by implementing full court pressure that nearly won them the game against Purdue on the road. Maryland held Indiana scoreless for a three plus minute stretch, while forcing three turnovers but eventually the Hoosiers figured things out. Which was worse transition defense or half-court offense? Troy Williams scored 10 of Indiana’s first 12 points in the second half and much of that was because of fast break opportunities. Maryland’s bigs did not get back, even off of made field goals, in transition and led to easy opportunities for the athletic forward. Carter felt that the Terps can “run with anybody”, but that clearly was not the case today. On the other end of the court Maryland looked worse than a junior varsity squad running offense. They got too deep into the shot clock before getting into a set, the bigs did not find the open shooter out of the double team, and 14 turnovers led to 20 Hoosier points. With the regular season over, what is next? The Terps have luckily secured their double-bye in the Big Ten tournament despite losing four of last six. Maryland will be the three seed if Purdue knocks off Wisconsin later tonight and play on Friday at 9 pm from Indianapolis in the quarterfinals of the Big Ten tournament. If Wisconsin beats Purdue, Maryland will finish last in the three-way tiebreak with the Badgers and Spartans and play at 2:30 against the four seed. If Wisconsin wins, Terps (4) will likely play 5 seed Iowa on Friday If Purdue wins, Terps (3) will likely play 6 seed Wisconsin. Filed Under: College Tagged With: Indiana Hoosiers, Jaylen Brantley, MARK TURGEON, MARYLAND TERRAPINS, MELO TRIMBLE, Robert Carter Jr.
Yours is a good assessment of this game. Terps have crippled their offense with the substitutions they make. Some subs are not offensive threats and our opponents know that. They can then play off those subs, and play even harder defense against the real scoring threats. It also makes it easier for them to block up the middle andrevent the drives to the middle of the basket that MD wants to do. We are getting a little better at rebounding, but, in this game, there were many times when all our players ran back on defense as soon as the s phot went up, instead of one of them going to get the rebound (or they were in too poor a position when the shot went up to even consider trying for the rebound). This shows a team not playing together or comfortable in their offense, again a problem with the chemistry when certain subs are put in.